Dolf Luque’ – The first Cuban-born major league ball-player to have a notable career. 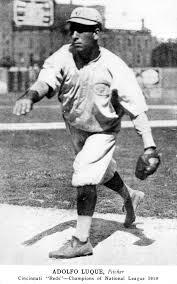 Luque” won 191 games in 20 seasons in the majors and pitched for the Cincinnati Reds in the famous Black Sox World Series of 1919. The historical and political relationship between the United States and Cuba has been complicated and contentious, but baseball has always been a common passion going back 150 years when Havana-born Esteban Enrique Bellan played catcher for St. John’s College in the late 1860’s. And then, there’s the genre of “Alternate History,” too. Listen in for for one of baseball’s famous urban myths.